When iZombie comes to television later this month, the series will feature an opening titles sequence utilizing the art of Michael Allred, the Madman creator and Silver Surfer artist responsible for the art on Vertigo's iZombie, the series on which the show is based. The series, developed by Veronica Mars creator Rob Thomas and producer Diane Ruggiero, is admittedly a loose adaptation, but bringing in opening credits that evoke the comics is one of the handful of ways that they connect the two. The CW has provided ComicBook.com with an exclusive look at the titles, which you can see below. "I think what we carried over was the big idea of the comic book which is this woman in her mid-20s becomes a functioning zombie and when she eats brains she inherits the memories," Thomas told ComicBook.com at Comic Con this summer. "Even in the comic book she tries to solve these outstanding issues of the dead and we play that in the TV series as well. What I needed was a story mechanism that allowed her to do it every week. I wanted very closed cases and working in the police morgue gave me a dead, murdered body each week which made it easier to adapt as a TV show." The series stars Rose McIver as Liv, Malcolm Goodwin as Clive Babineaux, newcomer Rahul Kohli as Dr. Ravi Chakrabarti, Robert Buckley as Major Lilywhite and David Anders as Blaine DeBeers. 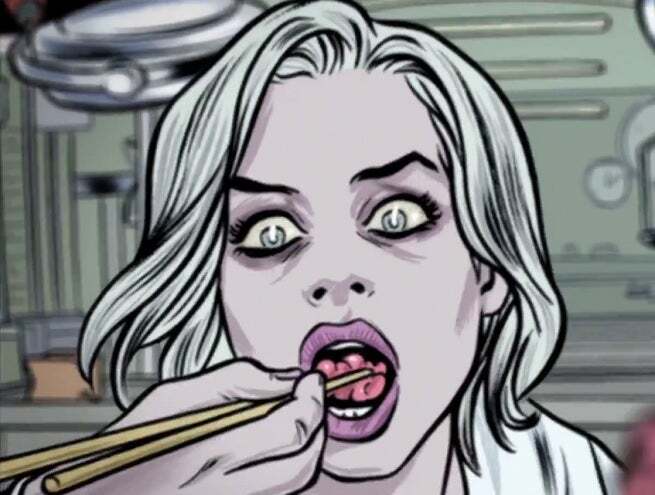 iZombie was created by Chris Roberson and Michael Allred and published by DC Comics' Vertigo imprint. iZombie debuts on March 17 at 9 p.m. ET/PT on The CW following the return of The Flash.